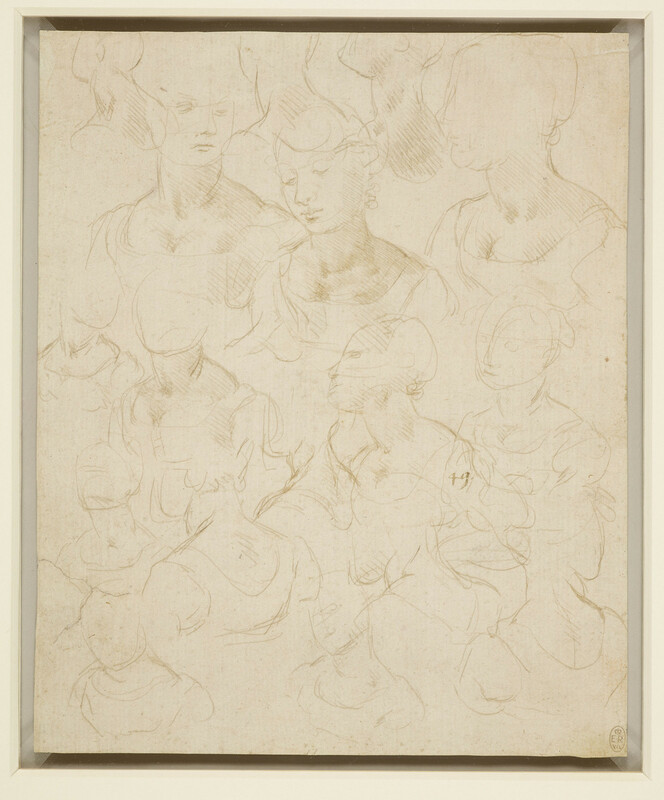 Numerous sketches of the head and shoulders of a woman, done to study the juncture of the neck and shoulders, the features of the head being roughly indicated, except in a few instances. The neck is drawn in many positions. Melzi's 49. Leonardo drew his model 18 times in two basic positions, from the front with her bust turned to the left, and from behind looking over her left shoulder. One can reconstruct the order in which Leonardo filled his page, and what may be the last sketch, in the centre of the left edge, is in the pose of Leonardo’s portrait of a Lady with an Ermine, almost certainly depicting Cecilia Gallerani, and painted while she was the mistress of Ludovico Sforza between 1489 and early 1491. This date would accord well with the confident style of the drawing. The pose of Cecilia in the painting is unconventional: she and her ermine are caught in a momentary reaction to an event beyond the picture frame, and that sense of spontaneity is what Leonardo was searching for here. The model need not look like Cecilia, as portraitists have commonly used a substitute model in studying a pose, referring to the subject of the portrait only for elements that required a likeness – often no more than the face.